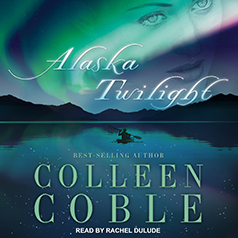 Alaska Twilight is the story of a young woman's emergence from the shadows of past sorrow into the light of forgiveness and grace. "You hide behind your camera instead of stepping out and engaging life with both hands. You're so afraid you'll fail at something, you won't even try." For some people, Alaska is a breathtaking wilderness adventure, full of light and beauty. For Haley, it is a dangerous world of dark dreams and tortured memories. On the surface, she's here to document wildlife activist Kipp Nowak's bear encounters. But her real reason is to unearth the truth about a past murder. The suspense mounts when another body turns up, and Haley begins to wonder if the tragedies she experienced in the past are connected to the dangers and mysterious incidents of the present. From behind her camera, Haley observes it all, including Tank Lassiter, the wildlife biologist who has been forced to lead Kipp and his team into the Alaskan backcountry. As she watches him with his work, she feels a growing attraction. It will take great courage and faith to confront the truth she once ran away from. Before it's over, Haley may be viewing herself from an entirely new angle.